We just came back from our general assembly in Athens. 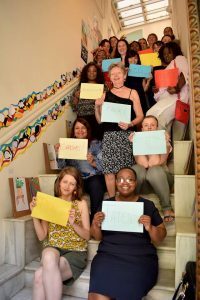 We were hosted by one of our members Melissa Network and spent three days discussing feminism from a refugee and migrant perspective. We also voted to accept the new members and we elected the new board of the Network. We are happy to announce that the new chair of the Network is Salome Mbugua, founder of AkiDwA, co founder of Wezeshadada organization and our previous vice-chair. The new members of the Board are Mina Jaf from Women Refugee Route, Noura Raad from Forum Femmes Méditerannée, Lucy Pollo Castillo from Por ti Mujer and Katherine Mahoro from Down to Basic Network. We are looking forward to work together for the next year!